You may have read – or experienced yourself – how effective the Norwex body cloths are against acne, including adult acne. So how does this work? Let me start with an anecdote. I have a customer who has adult acne, and for years has only been able to use the purist, most expensive cleaners and makeup on her face, or she breaks out. She lives in Australia, but actually has them imported from Europe, because only this one brand has ever worked for her. So last year she started using Norwex body cloths. But she didn’t *stop* using her expensive face cleanser. At least, not right away. Her past experience was that if she stopped using it, she would immediately start breaking out. But what she did, was took a two week trip away and left the cleanser at home. She packed her body cloth though! Well, for starters, the microfibre is very high quality, which means that just like the envirocloth will do an amazing job cleaning your surfaces with just water, the body cloth will clean your face. It is both a cleanser and an exfoliator. Use it very wet to clean without exfoliating, or wrung out for a thorough exfoliation. A dryer cloth mean more oils removed, and more exfoliation. A wetter cloths means less exfoliation and oil removal. How you use it will depend on both your skin in general, and your skin that day. Many people only exfoliate once a week, but cleanse daily, for instance. Secondly, the silver within the cloth then goes to town on any bacteria left in it after you rinse it out and hang it to dry. Okay, I’m starting to see why the silver within the Norwex body cloths and towels could have some benefit. Norwex actually recommends that if you are using the body cloths with acne you do use a clean one each day (they come in a 3 pack so that’s not so hard), but you can see how with normal face cloths they may be *causing* your acne. Once you’ve got it under control, you might find you can wash your norwex body cloth only once a week or so. People spend so much money on cleansers, lotions, medications and body washes, and I am finding more and more that my customers are simply able to give those things away. I had one customer tell me that after only a few weeks of her teenage daughter using the cloths very irregularly (as she had been doing previously with cleansers), already she was breaking out noticably less. Imagine if she used them regularly! 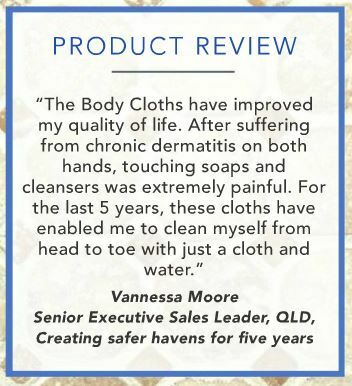 A good friend of mine who is also a consultant tells the story of a customer who used the body cloths on her son’s very pimply back. He would wash the dishes with no shirt on, so for three days his mother wiped his back with the body cloth while he was doing dishes. After three days, his back was clear!! So in summary why do they work? The silver, which means your cloth is not growing bacteria in between uses. Similarly, another consultant, Mandy Studler, posted on the Norwex facebook page that she has used every skin treatment under the sun to try to get rid of adult acne, and yet her face had never looked as great before as it did after months of using nothing but Norwex. Save money and time, stop putting chemicals and plastic microballs onto your body and into the water ways, and clean up your skin at the same time. How awesome is that? Note: there are two kinds of Norwex face cloths – the “body cloths” and the “makeup removal cloths“. Both can be used to replace a face cleanser AND normal face washer, and both contain baclock (ie the antibacterial silver). The makeup removal cloth though, is made from a suede microfibre, which will not exfoliate. The body cloth – the more you wring it out, the more it will exfoliate. For those that prefer it, there is also the body scrub mitt and the back scrubber – these have the body cloth fabric on one side and a more scrubby, exfoliating fabric on the other. The back scrubber is also great for getting to feet and even knees for those who are less mobile (or too pregnant to see their toes, LOL). The back scrubber is also fabulous if you have “bacne”, however, keep in mind the recommendation that you wash more often, when using with severe acne. Have you struggled with acne? Have you tried using the Norwex body cloths? What do you think? Thanks for this. My sister was just telling me about these the other day – she has bought them for her teenage kids and says they are making a HUGE difference to their skin (and a whole lot easier to get them to use than 1/2 dozen different products!). BUT, she said she is using the makeup removal cloths on her face instead. Is that just as good? That’s a great question. And the answer is yes – and no – depending on your skin! The makeup removal cloths are made from a suede microfibre, so they are much smoother and thus don’t really exfoliate. They are a much gentler cleanser than the body cloths, and for some people, they are a better choice. Basically I would recommend using the makeup cloths if a) you have very sensitive skin, or b) you are taking of eye makeup every day. The area around your eyes and lips is much more sensitive than the rest of your face, so it is a good idea to use the makeup removal cloths for those areas. I know a lot of people who use the makeup removal cloths daily, and then use a body cloth just once a week on their face to exfoliate (but probably daily on the rest of their body in the shower). Personally I don’t wear much makeup at all, and I don’t have sensitive skin, so mostly I just use the body cloth, but I use it very wet in the shower, so I am still not really exfoliating a lot. They both come in packs of three, but what I often do is split them up and sell a pack with two body cloths and one makeup removal cloth, for people to try. If your sister’s consultant lives near to you, you could have a chat to her, she will likely do the same thing. What is the best way to clean/wash the body clothes? Can the clothes stop working after 4 months? There is no reason they should stop working after 4 months no, BUT if you’ve washed them with fabric softener, that would coat the fibres so they wouldn’t work well, and a washing powder with fillers (in Australia, most commercial washing powders contain up to 1/3 fillers), that can do the same thing although more gradually. Otherwise, in terms of the best way to wash them – I have found with my body cloths and kitchen cloths, it works best if I wash them in hot wash from time to time (mostly I wash in cold). I think because they can both get quite a build up of organic matter in them, and the hot helps to open up the fibres to release the build up. How necessary and how often this is needed seems to depend on the person (we are colour coded in our house with body cloths, so the same ones always go to the same people), and their skin type I guess. So in brief, make sure you are ideally washing with a filler-free laundry detergent, no fabric softener or bleach, and try washing on hot once in a while. Hi I’m not sure if I’m a bit late to the party but I’m interested in buying these clothes for my adult acne 🙁 it’s mostly okay but you know how these thing are. I’m wondering if you are supposed to use moisturiser after using the cloths? I see this comment was from 2016. These clothes were just introduced to me. Are you still available for questions? 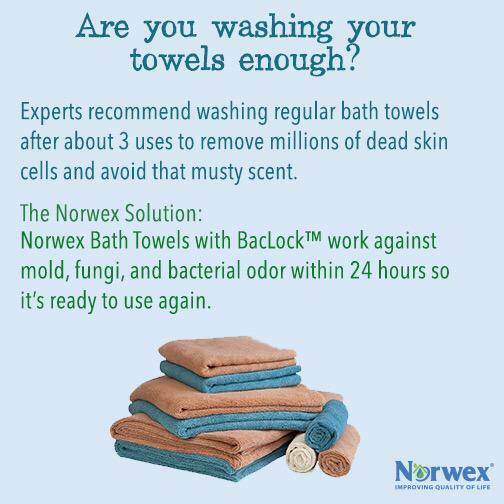 Hi Just wondering if you the norwex body cloths for your entire body and if you do do use any soap at all with them? Yes, for your entire body, and no, you don’t need soap at all. I know people who still use a body wash, more just for the luxury and the scent, but it’s not needed to clean your body! Ok, so I started using a body cloth for washing my face. But I’m not sure what temp water to use on it. I typically wash my face with warm water to open pores so that the dirt can be washed out, but if I’m using cold water on the cloth to keep the fibers tight, then it’s actually closing my pores and only getting surface dirt and dead cells off. Then if I use warm water on the cloth (which will loosen the fibers) the cloth will be less effective in trapping bacteria. What to do? In answer to your questions, if you want to use warm water, that’s fine. If it’s okay on your skin, it’s not going to be hot enough to be an issue for the cloth, and it will still clean you just fine. I recommend using them in the shower all the time, and I *definitely* do not suggest doing that cold! LOL. I am 14 and I have little acne bumps on my cheeks, as well as blackheads. My skin is somewhat sensitive too. I recently purchased the graphite body cloths, and I have seen some difference but I was wondering if I wash washing my face the proper way? What I do is I exfoliate on Mondays and Fridays (because schools carry a bunch of bacteria in the air) and just cleans for the rest of the remaining days. My main concern is that, are the body cloths the right thing to use for my hormonal acne? I am so sorry, I’ve only just seen your comment. In short, yes, it sounds like you are doing the right thing. How often you should exfoliate really depends on your skin, so there’s a bit of experimentation involved. But what I understand you to be doing – twice a week you wring out the cloth to exfoliate as you clean, the other days you just clean with a lot of water in it? – that sounds fine. I personally use it fairly wet all the time (in the shower), but my skin is older and probably dryer. It’s also good to go for a clean cloth – or at least a clean side of the cloth (so your 3 cloths would last 6 days) each day, when you are using them to manage acne, though it doesn’t sound as though yours is very serious, so you may not need to do that, as long as you are rinsing it thoroughly and it has time to dry in between uses. I just wash mine once a week usually. This is a great post. I am also suffering from acne, also having sensitive skin and I tried many products already and their products, but after I discover this one I think I have to try it. After using the cloths, should I still follow with my retinA? ….or should I give this up? I have super oily skin. Hi Heather, I am not really sure what retinA is, and I’m not a demotologist, but my general recommendation would be to try just using the cloths. A light moisteriser afterwards may be a good idea though, I use the Norwex Face & Neck gel which is aloe vera based and very light (because I have oily skin too), but I don’t use any other products to clean or dry my skin, just the body cloths with water. Hello- I have a follow up question. I got one free body cloth from a party I was at. If I want to use it for my face I have to launder it everyday? That seems like a lot. I thought with Norwex you shouldn’t need clean(launder) them often. So I guess when you say cleaner the towel do you mean launder? It is only recommended to launder it that often if you have fairly serious acne. I have one in my shower and I launder it maybe every two weeks! But, my 15 year old has developed acne, so I have given him a pile of them in the bathroom, and told him to swap his out every day or two for a clean one. Do you think washing with the body cloths and water is enough to remove foundation and other makeup? I have been using them with a mild cleanser to make sure the makeup is totally gone, but it sounds like maybe I could just use water. Hello Kirsten, great site, I love Norwex, I have very sensitive skin and rosacea, I have been using the facial cloth and/or the body cloth for about two months now and have a much clearer face and I have not had to use my rosacea prescription at all. I love the body glove, I exfoliate and then use the smooth side to shave my legs, without Norwex, within an hour my legs are so dry and flaky, NOT with the body glove though! Love it! I do have a question though about the body cloth, what about our “private parts” I still feel the need to use soap or body wash, is it necessary? Thanks for your wonderful testimonial!